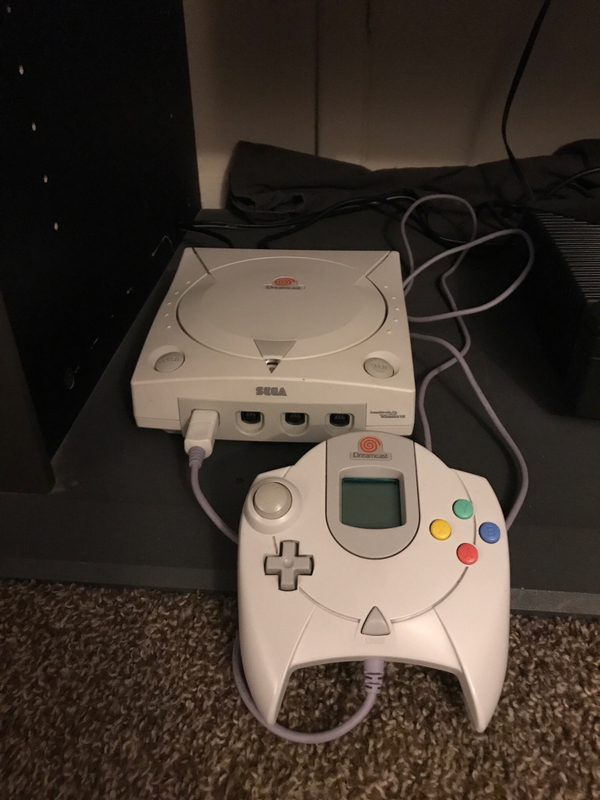 News	Forums Dreamcast Lounge New Member Introduction New to Dreamcast collecting and forums such as this! I’m just some twenty five year old guy who played about every big console under the sun. I never had an opinion on the SEGA Dreamcast though. You see, I got one as a gift around 2003-2004 (I think) with a copy of Street Fighter lll: Third Strike. I fell in love with the game, but not the console. I didn’t know anyone who had a Dreamcast, so I couldn’t borrow games or get recommendations. After playing a lot of Third Strike I put the console in the closet and moved back to my XBOX, PS2, and GameCube. Yeah I had all three and was a lucky kid for it too. Until the Shenmue 3 announcement I literally would only ever pull out the Dreamcast one more time to play third strike before the HD rerelease of that game came to the Xbox 360. But when Shenmue 3 was announced I saw kids and loads of people getting truly emotional to a sequel. Why? I didn’t get it. I knew what Shenmue was. Roaming the internet back in the dial-up/start of dsl days I remember seeing Shenmue l. Hell I recall rumors about three in magazines Back in the day. With the reaction I wanted to see what this Shenmue game was all about. So I went to EBay and bought a copy of Shenmue and a VMU altogether for about thirty five dollars. I dusted off the Dreamcast and put in Shenmue for the first time. I’m not going to lie. Shenmue is one of the greatest games I have ever played. The first time you walk to the town and FREE 1 plays. Oh my God it moved me. That can sound crazy but it really did get to me. The whole experience was crazy. This was on the Dreamcast!? I was missing out on this!? I immediately bought the sequel for the XBOX and figured that was t for the Dreamcast. About a month ago I traded in some records and extra SNES games with my loose copy of Third Strike to a local game store. I was bored and figured it would be good to get a Dreamcast game or two. I wanted to play some more games for it. I had the itch. I got more than I expected, so I picked up Sonic Adventure, the house of the dead 2, Resident Evil: Code Veronica, and Space Channel 5. I’m now addicted. I bought more and more games and even found a copy of a game in the trash (SPAWN...and it works!). I think what made me realize that I’m now in love with this console is the fact that I bid HARD on getting Skies of Arcadia. I’m about six hours in and in awe. The different types of experiences this console gives out s crazy. I have a fishing rod controller and can play fishing games then change to a light gun to play House if the Dead, then get my Puzzle fix with Chu Chu Rocket! It goes on and on. I’m only dipping my toes and...well I want to jump in. I’ve noticed it’s hard as hell pick up games for this console at decent prices nowadays. I figured I would network with people who care about this console and hey I could learn a thing or two AND maybe have some crazy cool experience with some games I’m seeking out. I would love to get a Dreampi and play PSO with some people one day. To play the Dreamcast online is a goal I intended to hit this year or at least next year. Sorry for the rambling, but man I love this console. I figured I would show how weirdly fast I got into this console all of a sudden and how fresh I am to the “scene”. Do you have any games you suggest I play or go out of my way to get? Any tips on getting harder to get games such as: Cannon SPike, Gunbird 2, Tech Romancer. I know these aren’t the most original questions, but once again I’m fresh to the scene! Included is a picture of my console and the games I have so far (SPAWN is in the blue case. As I stated I found it in the trash, so I had to order a repro case for it). Re: New to Dreamcast collecting and forums such as this! Welcome to DC talk! I personally love demolition racer-not exit on dreamcast. I still play it all the time! Soul calibur is another great title! You have the start to a great collection! The-Amazing-Mr_V wrote: Welcome to DC talk! I personally love demolition racer-not exit on dreamcast. I still play it all the time! Soul calibur is another great title! You have the start to a great collection! I found a copy of Demolition Racer for ten dollars new! I may pick that up soon. Oh God yes I need to get Soul Calibur. It looks gorgeous. I think two big games I’m eyeing are still the Power Stone series. I just wish I could find them for a better price! Maybe one day. Have you considered importing games from Europe or Japan to cut down on costs in some cases? Many of the games are in English, and it is simple to play imports on a Dreamcast. Wow thanks! I didn’t know Mr. Driller was on Dreamcast. Gonna check that out. I’ve considered importing, but I’m on the fence. I may have to do it for games such as power stone. These prices are crazy. Any games you suggest that are cheaper? Yes! I want to play games online! Specifically PSO! Not sure what country your in but I have a bunch of pal dreamcast games I want to offload, in varying degrees of condition etc. I think I have a boxed powerstone or powerstone 2 though. If your interested we can make a deal. Wrath of Khan wrote: Not sure what country your in but I have a bunch of pal dreamcast games I want to offload, in varying degrees of condition etc. I think I have a boxed powerstone or powerstone 2 though. If your interested we can make a deal. I’m in the USA. Don’t PAL games run slower than JP and US games due to Hz? Possibly. But you can run pal games with a boot disc or modded console. There are some pal exclusive games too. Would you happen to have a list and prices? I’m willing to look at them. InnerCityTantrums wrote: I’m in the USA. Don’t PAL games run slower than JP and US games due to Hz? Condition varies, some boxed some partially boxed etc. Not sure of prices but quite reasonable. I just want to sell them on at this point.